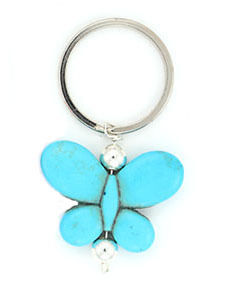 These butterfly key rings are made out of magnasite. They measure approximately 2 1/4" long including key ring and are about 1 3/8" wide. Crafted by Navajo artisan Sandra Francisco. The oxidized brown color in the center of the butterfly is permanent, part of the stone.